ASEAN (the Association of Southeast Asian Nations) needs to stay committed to trade liberalization and economic integration, Prime Minister of Singapore Lee Hsien Loong said in Singapore on Thursday, August 2. 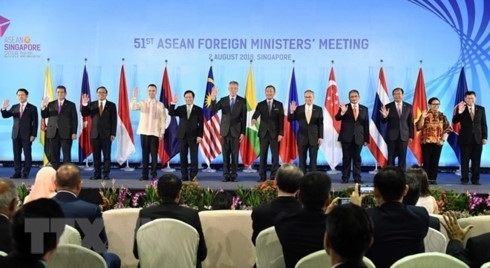 ASEAN countries must continue to strengthen the open, inclusive and ASEAN-centric regional architecture, which has supported the region's peace and stability, he told the opening ceremony of the 51st ASEAN Foreign Ministers' Meeting that began on Thursday in Singapore. The rules-based multilateral trading system, which has underpinned ASEAN's growth and prosperity, is under pressure, he added. He said it is important that ASEAN continues to support the multilateral system and work with like-minded partners to deepen its web of cooperation. Lee also said he is glad that ASEAN countries are redoubling their efforts to conclude the Regional Comprehensive Economic Partnership (RCEP) by the end of this year. According to the prime minister, the RCEP, comprising 10 ASEAN member states and its six free trade agreement partners, namely, China, Australia, Japan, India, the Republic of Korea and New Zealand, will be the world's largest trading bloc that covers a third of the world's current annual gross domestic product. The RCEP and the ASEAN-EU Comprehensive Air Transport Agreement will "send a clear signal of ASEAN's commitment to trade liberalization and economic integration," he said.